Monday May 23rd 1921 LeGrand is 27 years old today. The party was last night. Rob & Hattie went to the cemetery to do some work and other errands in town. She & Cora to a luncheon at noon. I did up the work and sewed on the machine all afternoon. Mollie came to stay all night. The evening on the porch pleasant. 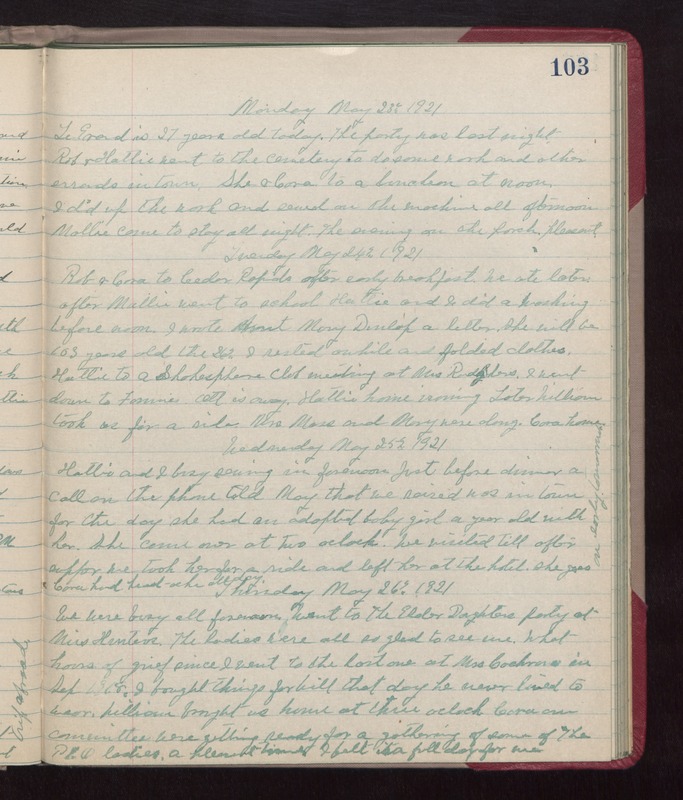 Tuesday May 24th 1921 Rob & Cora to Cedar Rapids after early breakfast. We ate later after Mollie went to school. Hattie and I did a washing before noon. I wrote Aunt Mary Dunlap a letter. She will be 103 years old the 26th. I rested awhile and folded clothes. Hattie to a Shakespeare Club meeting at Mrs Rodgers. I went down to Fannies. Ott is away. Hattie home ironing. Late William took us for a ride. Mrs Moss and Mary were along. Cora home. Wednesday May 25th 1921 Hattie and I busy sewing in forenoon. Just before dinner a call on the phone told May that we raised was in town for the day. She had an adopted baby girl a year old with her. She came over at two oclock. We visited till after supper. we took her for a ride and left her at the hotel. She goes on early tomorrow. Cora had head-ache all day. Thursday May 26th 1921 We were busy all forenoon. Went to The Elder Daughters party at Miss Hentons. The ladies were all so glad to see me. What hours of grief since I went to the last one at Mrs Cochrans in Sept 1918. I bought things for Will that day he never lived to wear. William brought us home at three oclock. Cora and committee were getting ready for a gathering of some of The P E O ladies. A pleasant time. I felt it a full day for me.